Although I was raised on mostly soul food, I like to switch it up and cook a variety of cuisines. I’m not afraid to experiment and attempt to make dishes that I enjoy when dining out. Trying new dishes keeps cooking fun. I may not always get it right the first time. But I can usually get close enough to satisfy my craving. This Tofu Pad Thai was spot on. 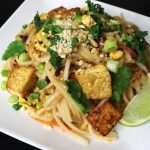 I absolutely love pad thai, and it blew my mind when I realized how quick & easy it is to make at home. The special ingredient is the tamarind concentrate in the sauce. It’s what gives pad thai it’s unique flavor. This Tofu Pad Thai is gluten free and vegetarian friendly- if you leave out the fish sauce. You can substitute it with tamari (gluten-free soy sauce) for the umami flavor. You can also omit the egg if you don’t eat them, and feel free to substitute the tofu with another protein of your choice. It only takes about 30 minutes to prepare this dish. Now let’s get to the recipe. 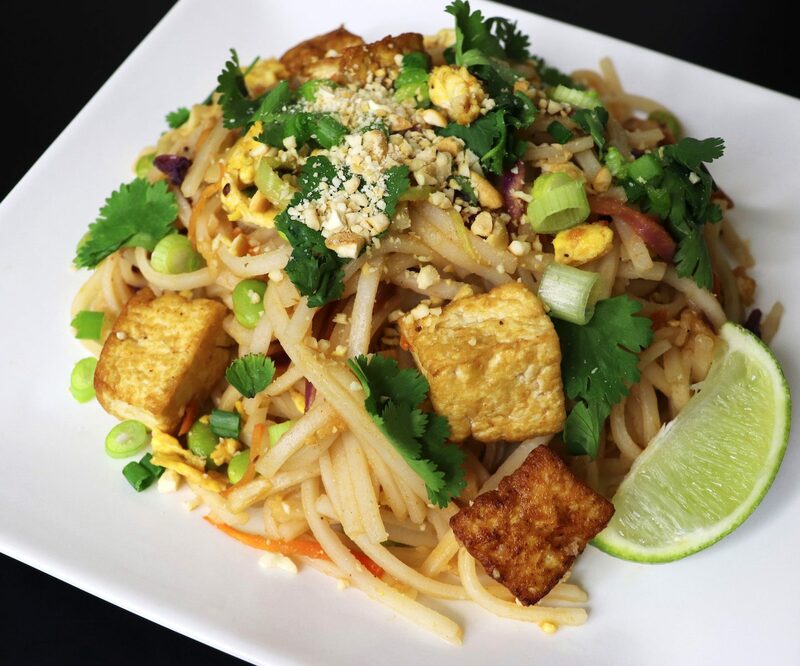 Quick & Easy Tofu Pad Thai that can go head to head with your favorite Thai Restaurant. First prep the rice noodles for the dish. Place them in a large bowl and cover with cold water. Soak for about 20 minutes, then drain before adding to the dish. Now to prepare the pad thai sauce, first mix the tamarind concentrate with the brown sugar, and stir until the sugar is dissolved. Taste to make sure the flavors are balanced, not too sour or sweet. Adjust as necessary. Now add the fish sauce, chili garlic sauce and water. Stir until blended well, and set aside. Next, prep the tofu. Drain off all of the water, then press the tofu between paper towels until any excess water is absorbed. Cut the tofu in half and store one half for later use (see notes). Cut the other half into large cubes. Add the toasted sesame oil to a hot wok and add the tofu to the pan. Cook on all four sides until brown and crispy. Then remove from the pan and set aside. Now add the eggs to the pan, and scramble. Remove from the pan and set aside. Next add the shallots and the garlic, and sauté until they start to caramelize. Then add the edamame and cole slaw mix to the pan. Stir fry for a minute or two, then add the tofu and the eggs back into the pan. To finish the stir fry, add the rice noodles and sauce to the pan, and use silicone tongs to mix everything well without breaking the noodles. 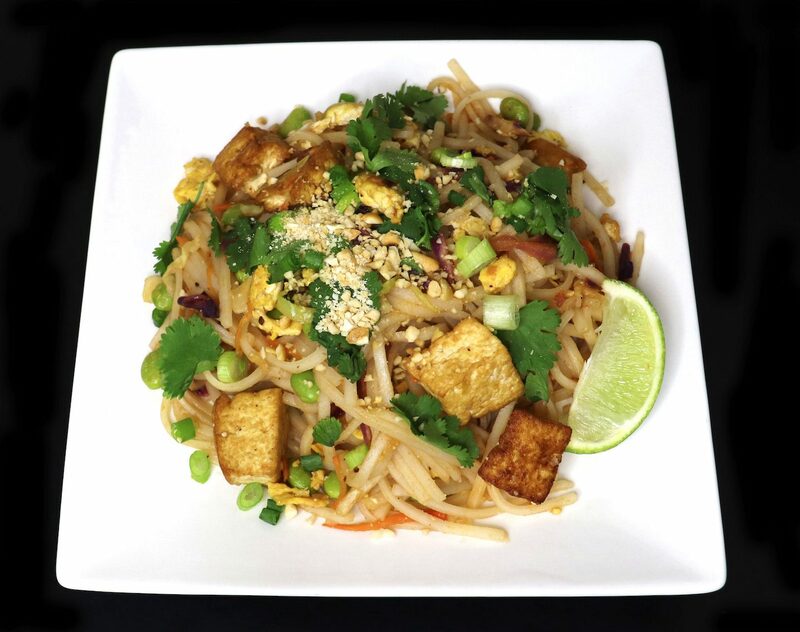 Plate the Tofu Pad Thai and garnish with the cilantro, scallions, crushed cashews and a lime slice. Squeeze the lime over the dish before eating. Enjoy. Feel free to substitute the tofu with another protein of your choice. Preserve the leftover uncooked tofu in a mason jar covered with cold water. Seal it tight and store in the fridge for up to 5 days. You can double the sauce recipe if you’d like more sauce, and adjust the ingredients to taste. When I’m not in the kitchen developing recipes and taking cool photos of food, you’ll find me over at my lifestyle blog, The Glamorous Gleam. Oh, I’m also a Freelance MUA & Hair Stylist.